Enjoy two (2) independent days in Edinburgh (pre/post) with three (3) days to explore the West Coast of Scotland - the Isle of Arran, Argyll, and the Ayrshire coast. A unique opportunity to visit the Island of Arran: often known as Scotland in Miniature. You will discover stunning scenery, beautiful beaches, ancient castles, standing stones, picturesque villages, and great local food and drinks. 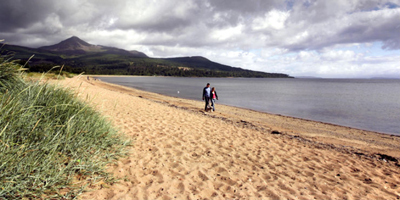 Stay two (2) nights in Brodick on the Island of Arran with pre/post nights in Edinburgh. Arrive in Edinburgh. Transfer to your hotel is included. You are free to enjoy this beautiful city on your own. 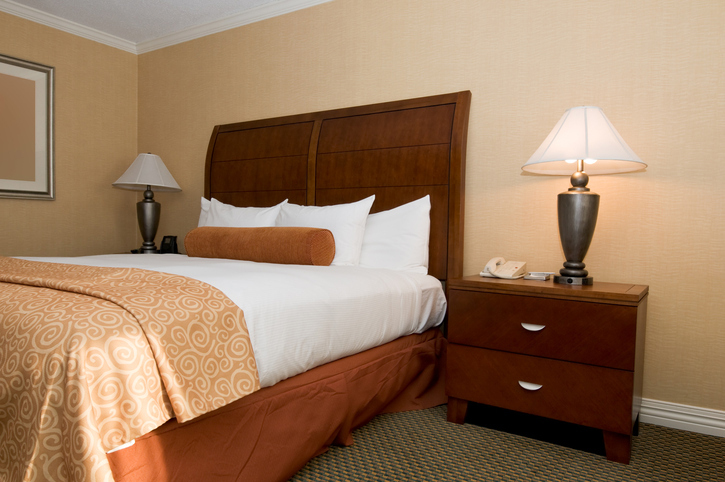 (Please note, hotel check-in is generally between 2:00 pm and 4:00 pm. If you are arriving into Edinburgh early - the hotel will be happy to hold your luggage until your room is ready). Depart Edinburgh at 8:30 am from designated departure point and travel west to Glasgow, Scotland's largest city. This tour may also begin this tour in Glasgow at 10:00 am from Glasgow meeting point outside Parish Hall, 266 George Street, G1 1QX (next to the City Chambers, between North Frederick Street and John Street), where a pre-night can be arranged in Glasgow as well. Depart Edinburgh and travel west to Glasgow, Scotland’s largest city, then into Ayrshire to visit the 18th Century Culzean Castle. The Castle dates from a peaceful time in Scottish history and has been associated with the Kennedy family since the 14th Century. Enjoy its dramatic cliff top setting, fine furniture and beautiful architecture by the famous architect Robert Adam. 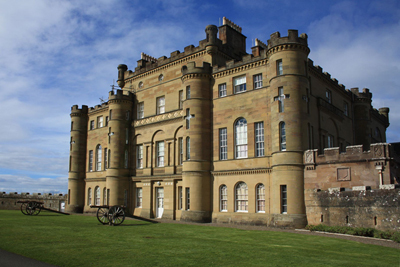 The castle is surrounded by Culzean Country Park (entrance fee) which has nearly 600 acres of stunning countryside and paths through majestic woodlands and secluded ponds, it’s a great place to explore. There is a café for lunch or you can to have a picnic in the castle grounds. After lunch you head into the heart of Burns Country. Robert Burns, Scotland’s national poet, was born in Alloway. Traveling towards his birth place you can see many of the places mentioned in his poems and songs. You stop at the recently redeveloped visitor center in Alloway where you have the opportunity to find out more about this remarkable man. Perhaps his most famous song is ‘Auld Lang Syne’ – sung on New Year’s Eve throughout the world. You continue to Ardrossan where you catch the ferry to the Isle of Arran. You arrive into Brodick, the largest village on the island, which offers stunning views of the imposing stature of Goatfell, Arran’s highest peak and Brodick Bay. You will be dropped off at our hotel or B&B in Brodick. Known as ‘Scotland in Miniature', Arran is alive with wildlife, rugged countryside, beaches, pubs, restaurants and cottage industries. There are many options of how we can spend our time on the island, depending on the weather and the groups' interest; our driver guide will arrange the best day out for us. The north of the island is mountainous with the highest point on Arran Goatfell. The village of Corrie and its neighboring village of Sannox sit in its shadow and are home to some of the nicest beaches on the island. At Lochranza we find the ruins of Lochranza Castle and also Arran Distillery, one of the last remaining independent distilleries in Scotland. Arran is home to many stone circles and standing stones dating from the Neolithic period and the early Bronze Age. After exploring this area we travel south through the harbor villages of Blackwaterfoot with its beautiful beach Sliddery and Kildonan. We might make a stop at the Arran Cheese shop for a taste of the local cheese or Arran Aromatics, a family owned business, which uses only natural ingredients to produce their luxury toiletries, their products are now famous all over the world. Also at Brodick is Brodick Castle and in the shadow of this imposing red sandstone castle we also find Arran Brewery. This microbrewery blends naturally with its stunning surroundings, combining the islands unique water and the finest local ingredients. We can sample this ale in many of the local pubs and restaurants, a perfect way to round off your day! Today we return back to the mainland by taking the small ferry. This short 30-minute crossing will take us onto the Kintyre Penninsula. 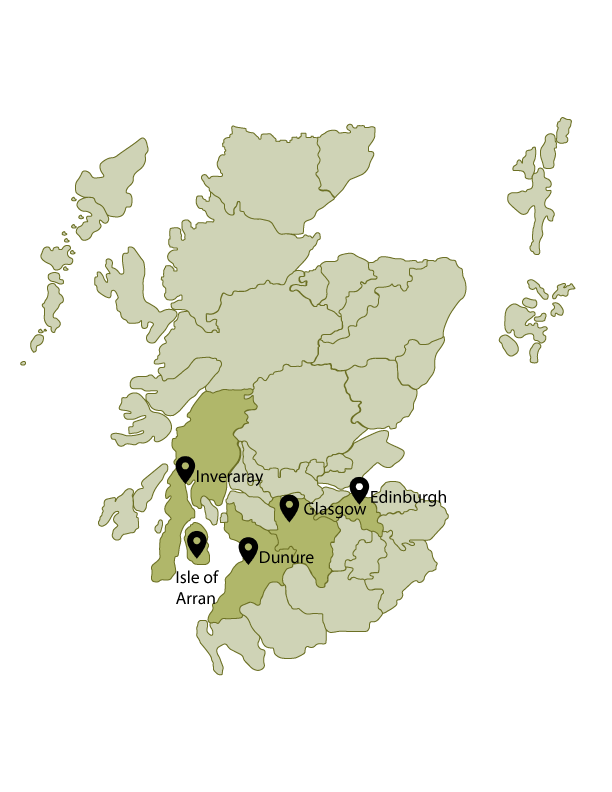 We travel up this beautiful, lush green peninsula to the charming fishing village of Tarbert. The village sits on the narrowest strip of land between the two bodies of water, forming a natural harbor. From Tarbert we follow Loch Fyne toward the whitewashed village of Inveraray, with some free time to explore this lovely village and have lunch. After lunch (on your own) we continue over the mountain pass The Rest and be Thankful. From here is a short drive to Luss and the Bonnie Banks of Loch Lomond before returning to Edinburgh at 7:15 approximately. Your tour ends at Waverly Bridge in Edinburgh, where you will make your own way back to your pre-booked hotel. After breakfast, transfer from your hotel to the Airport for your return flight to the U.S.
Departure date is the date one would start touring in Edinburgh including any pre/post nights. Does not include air travel. 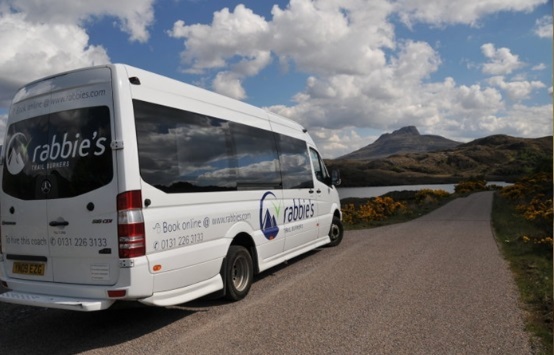 Although our UK tours are guaranteed with a minimum of 2 passengers, it does not mean a date is guaranteed until we check with the Edinburgh office. Although we get regular updates, a tour can sell out and we may not yet have it noted above. We must first advise of a guarantee before airfare is booked and ticketed. Thank you.